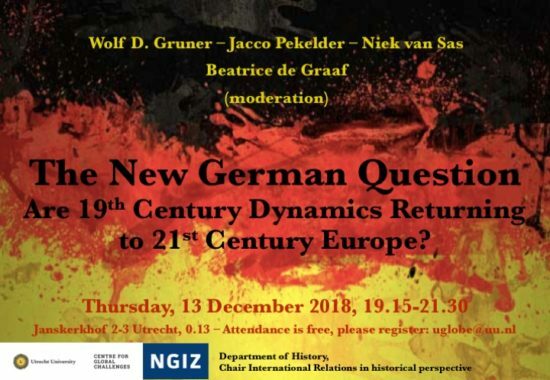 NGIZ » Events » Symposium: The New German Question: Are 19th Century Dynamics Returning to 21st Century Europe? Symposium: The New German Question: Are 19th Century Dynamics Returning to 21st Century Europe? For centuries the political construction of Germany was the central problem of European power politics. Recently, journalists, politicians and scholars, commenting on events on the European and world political stages, have proclaimed a “New German Question”. Ever since the financial crisis, calls for German leadership abound, and since the election of Donald Trump these calls have become louder. Germany’s population and political elites are ill at ease with these demands, but still take on the responsibility. It seems uncertain, however, what the long-term effects of a more assertive attitude of German leaders will be. When Germans really start to lead, their neighbours, France, Poland, the United Kingdom, the Netherlands, Denmark et cetera, might very well become nervous again. In other words: a resurgence of the German Question is looming. To learn more about these prospects, on Thursday, 13 December 2018, Utrecht University’s Centre for Global Challenges, its Chair of International Relations in historical perspective as well as the Utrecht Chapter of the Netherlands Association for International Affairs (NGIZ) organize a symposium at which three notable experts on German and European politics and history wager a comparison of the dynamics of European politics in the 19th Century, before Bismarck realized the German Kaiserreich, with the fluent situation of our world today. Attendance is free – please register: uglobe@uu.nl. Click for more information.